Google has confirmed to TechCrunch that the company is currently testing a new chat service for business listings right inside of Google Search results. As an example, if you were to search for a restaurant, you could ask an employee at the restaurant if they were busy or featured a vegan menu, then receive an answer in real time. For right now, the chat is a closed test, and when I clicked on the “Chat Available” button, I received an error message in a pop up window. 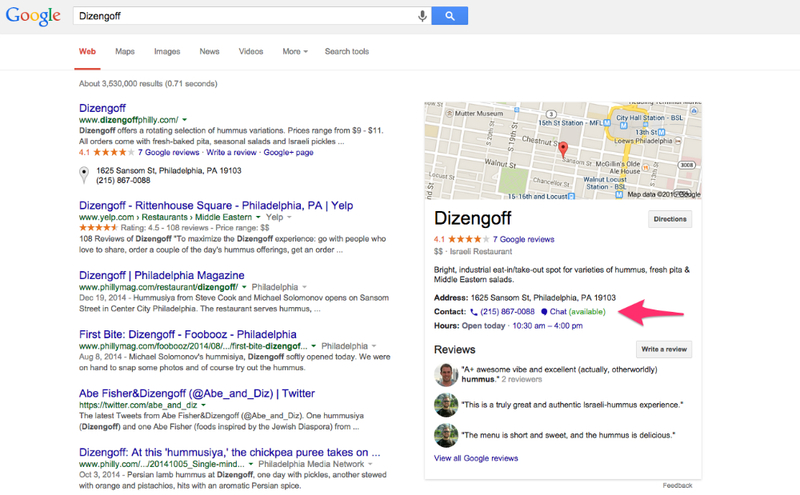 So for now, don’t expect to be chatting with your favorite local businesses right from Search results. The service appears to be entirely powered by Hangouts, and can be accessed via desktop computers and mobile devices. Google is fortunate to have an ever-growing index of businesses on Google Search, and essentially, all they would need to do is provide it to the business owners for implementation. If wait times are not going to be an issue, then I could see this being a great alternative to calling for customers.